I just upgraded to HQ28... Haven't had a chance to use the Ravager M8. General of "Crimson & Gold" and "Commanders of the Free World"
Come join us if you are looking for a good alliance! To put it frankly, they are totally pointless both in defense and offense. They have no chance to defend against anything, I had some hopes they would be good using their "area" attack against striker blobs but no. Another pointless unit as pointed out above, same as mlrs, commandos and whatnot. M8 is painfully slow, moving a bit faster than Colossus, but once M8 arrives in firing position it need few seconds to expend before it can actually fire missiles. M8 has a short range, roughly similar to Tanks. M8 is vulnerable in front of defense structures. M8's missile will be shut down by dome laser, and MK I.
M8's fire power is reasonable, however based on above points, M8 is never able to catch up with other units to make use of its firepower. I did many attempts to play with M8 and pair it with different units, however I can't find any reasonable combination that would benefit from M8's firepower. Because M8 is too slow and too short range. The only exception is to donate M8 in alliance war as defense units. In rare cases M8 is doing better in defense than other kinds of troop. Please make it faster. At least by removing the 'expansion' time. We'll take note of your feedback and suggestions for the improvement of Ravager M8, Commanders. This will help us for further assessment of this new offensive unit and we'll be glad to hear more of it. Thanks and keep on enjoying the game. As others have said. Too slow at expanding, and despite the high hit point count, is easily disposed of in battle. 1. Titan- Very useless- Way to slow for a timed style game. They target walls 1st, There canons range is to short and may get off one shot per 5 battles. 3. Tomahawks- Very useless- to slow, battle can be over without a single shot being fired. 4. Stealths tanks (offensively)-useless- they get to far ahead of the pack, leaving them vulnerable. not enough per tarmac. 5. LGL-useless- not enough available per tarmac to make them a contender. To weak. 6. Apaches- useless- To much emp style defense making air assault a thing of the past. to slow. 7. MKI-Very useless (offensively)-To weak to make them even a consideration. Mlrs, spiders, tanks, commandos, helos, all very useless. So with a quote, unquote strategy game (more like resources grinding game) what is the thought process in releasing a slow, weak moving units where the clock is your enemy? Just my humble opinion's guys. A lot of you will disagree. We need more variety then just strikers. I've bin playing since the release of this game and its just sad that strikers are still the go to unit of choice. Thanks for spending time to write the truth about the game in its current state Fury. You nailed it. Another useless unit not worth the time investing in it,just remove them from the loadout all together! Do you guy's even test anything before pushing it out? Seems NOT to me,instead of ironing out the bugs and glitches you keep introducing worthless assets no one is going to use .....ever! Quicker and does larger damage than you could ever imagine! 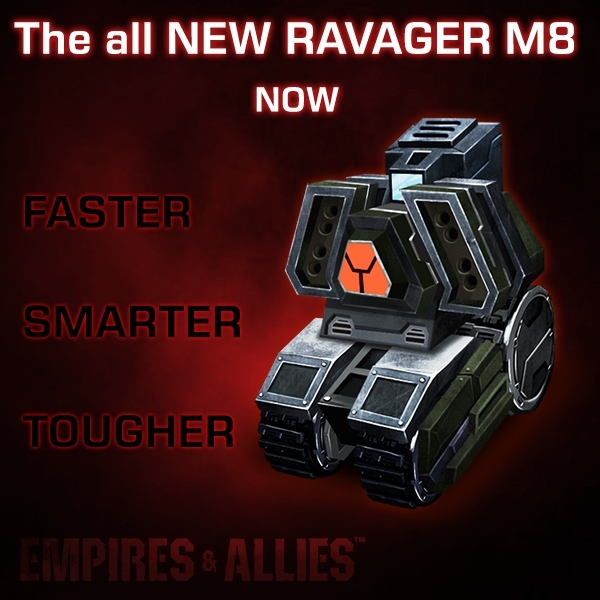 Get the Ravager M8 only on Empires And Allies. Share your feedback here! The ravager is still too slow and weak. They are useless in battles relative to other units we have at our disposal. For something that you can only obtain at higher HQ, it is totally a disappointment. Zyngaaaaaa! Thank you!!!!! Thanks for updating M8 ravager when HQ31-32 released! Now I found M8 can stand easily against Stealth tanks. I’m not afraid any STs! Maybe Ravager missiles should split into pieces of AOE damaging shrapnel (Similar to how Tomahawk missiles burst in mid-air before raining down on enemies) when shot down by Hunter Drones or Aerial Defenses? The shrapnel should do a slight amount of damage too, just so they can still have the upper hand. And I agree with the comments up there, more Ravagers per tarmac, faster movement speed, and no expansion time. Also they should have a slightly longer range, just so their power can be used to the fullest extent. Still useless. Let's revisit this thread in another year or so. For a top tier unit it is indeed a bit offensive, agreed.